The Myth of the Literary Cowboy, Part 4: Hi-yo Cowboy, Away! Home » Uncategorized » The Myth of the Literary Cowboy, Part 4: Hi-yo Cowboy, Away! Back in December, before an afternoon showing of The Hobbit, I got my first glimpse of the trailer for the big budget adaptation of The Lone Ranger. Sitting there enjoying my smuggled in Diet Dr. Pepper was not the first time I’d run across the film—I had read some early reports on it over the past year or so. But actually seeing the cribbed-from-Justified aesthetic on the big screen was something else entirely. Of course, I soon forgot about it again as my thoughts turned to more important questions, like does Gandalf drunk dial those eagles when he needs a sober ride? However, since that time, I have found myself in pop culture shame spiral as I grapple with my complex feelings about this update of the classic Lone Ranger television show. These feelings strike at odd times, such as a recent discussion with my Comp II class about the meaning of the dam in “Powwow at the End of the World.” I suddenly flashed back to that trailer and felt like I should send an apology note with muffin basket to Sherman Alexie. The movie is being touted as the most expensive Western ever made, and according to star Johnny Depp will focus more on his Tonto character than the original show. Perhaps a more accurate assessment would be it focuses more on Johnny Depp and would even if he was playing a cactus. Whatever the spin or the budget, the movie looks like a style-hammer battering substance, like Pirates of the Open Range, like black-hole plot built around a big name and Instagram filters. And yet—heaven forgive me—I want to see it. Before Depp became an honorary Comanche as part of his acting preparation, and before Alexie used Tonto as a badge of dishonor in his poems, essays, and stories, The Lone Ranger was a 1930s radio show about a Texas Ranger turned vigilante who fought for justice in the Old West (sound familiar?) with the help of his faithful Potawatomi Indian sidekick, Tonto. On air from 1949 to 1957, the Ranger wasn’t the only cowboy to ride across the smalls screen. The 1950s and 60s brought a plethora of Westerns to television in the form of Maverick (1957-62), The Cisco Kid (1950-56), Gunsmoke (1955-75), Bonanza (1959-73), and Rawhide (1959-65), just to name a few. Television and suburbia allowed families to enjoy in their own homes a serialized format that married well with the cowboy. All those American traits that defined the original cowboy? A perfect fit for growing post-World War II families who wanted adventure with a dash of traditional values. Tonto aside, the Ranger was perhaps my favorite character from these series, in part of because his mask reminded me of my beloved Zorro, which I watched in reruns on Disney Channel. (I had a ridiculous crush on Guy Williams without realizing that he would have been over sixty when I was nine. Come to think of it, Disney Channel reruns caused me to have a number of inappropriate crushes.) For me, the Lone Ranger was the first cowboy who had a superhero vibe to him. It’s no wonder he lives on in comic books and novels. While the Ranger left television in the late 50s, other shows clung on into the 60s and even the 70s after the Golden Age of Hollywood Westerns came to an end. Those television cowboys, however, only hinted at some of the changes the big screen cowboy had already undergone. 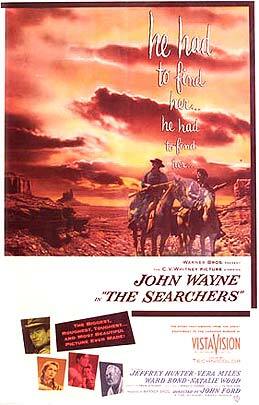 The Searchers, although technically still in the Golden Age (1957), foreshadowed the trail that lay before the cowboy character. John Wayne, in one of his many anti-hero cowboy roles, plays Ethan Edwards, a rumored outlaw who returns to Texas to search for his kidnapped niece (Natalie Wood). Ethan is a far cry from his fellow television cowboys during this same time—openly racist and savage, he is the dark son of the West who would rather see his niece killed than part of a Comanche family. The Searchers, then, is not as much about the search for a kidnapped girl as the search for one man’s humanity and redemption. In the end, it is not Ethan who kills his enemy—because to do so would result in his complete moral destruction. This concept of the tattered, desensitized cowboy hunting his soul is one that would pervade in Westerns in the years that followed. John Wayne’s cowboys, while we might like to remember them as more traditional, leaned toward moral ambiguity. He often played men who have been corrupted by the lawlessness of the West and must take the epic journey to redemption. Clint Eastwood, who built his resume on Rawhide, donned the mantle of “The Man With No Name” in the “Dollars Trilogy,” those spaghetti Westerns of the mid-60s that took violence and moral corruption to a darker place (something the pulp magazines and novels had done years before). The cowboy was no longer the man in the white hat—he was the anti-hero who walked the line between good and bad, sanity and madness, salvation and destruction. He represented the West as it cannibalized its own myth. On the page, Louis L’Amour continued his success for decades with his numerous series while McMurtry and Elmore Leonard used realism to construct their cowboys. 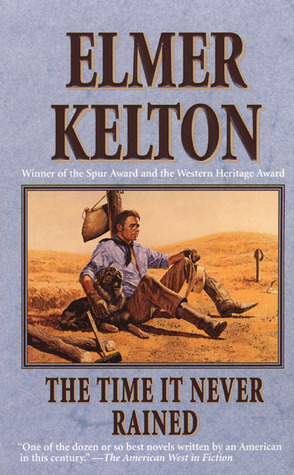 Elmer Kelton penned plenty of traditional Westerns and pulp short stories before moving the genre forward with his flawed cowboys who were more man than myth without the viciousness of some of their literary brothers. Minimalist Cormac McCarthy has his own corner of the Wild West with ventures such as All the Pretty Horses and Blood Meridian. The latter of these happens to be the first book I read for graduate school. It’s a cruel book, beautiful and savage in a way that only McCarthy can be. There are hints of the cowboy character in its pages, although he is mostly lost among the grotesque. For the most part the cowboy in either the traditional or deconstructed sense remains in stasis—he turns up in comic books and video games, but readers are left with writings from the last century for their Western needs. As a book lover first, I never thought I’d be glad for films and television, but they provide a home for the cowboy; shows like Deadwood and Justified (based on Elmore Leonard novels) indicate an enduring interest in the cowboy character in some incarnation. So come July, I hope The Lone Ranger blasts away my misgivings. If the cowboy is truly a reflection of the times, what does this reboot say about us? We like vengeance tales? Marginalized characters? Johnny Depp? Are we simply out of ideas or does this story need retelling? Whatever the answer, I’m excited to find out, even if it means wearing a wig to the theater. Join me next time as we wander down the trail of real-life cowboy poetry.